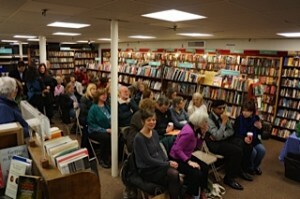 Readers feedback at the book launch party on March 25th. “My good friend…brought me an inspirational book called Lasting Words and said that the author was speaking at our own Brookline Booksmith…I walked over…joining …an overflowing room of people who were even seated on the floor and crowding all of the steps leading upstairs, who wanted to hear Claire’s wisdom and take her advice about leaving our mark here on earth. I was very moved.” —E.D.